In Spring 2018 I taught a class of the series (Un)common reads for the UF Honors Program. We read and discussed Charles Darwin’s journey around the globe “The Voyage of the Beagle”, a classic and must read that provides a fascinating insight into Darwin’s keen observations and integrative power that are the foundation of his theory of natural selection and the struggle for existence. 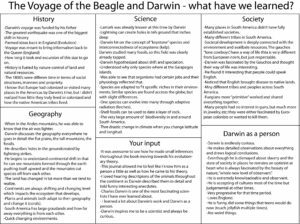 In this class we collectively discovered passages where Darwin informally described some of the ideas that were the foundation of his theory and we are also going to discuss the places that Darwin and the Beagle visited and the importance of exploration. At the beginning of the class students knew that Darwin is considered the father of evolution, that he visited the Galapagos Archipelago and that worked with finches. 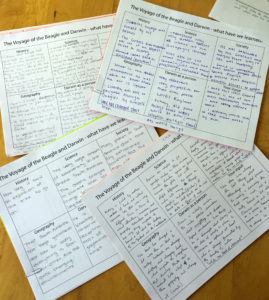 By the end of the class students had a better understanding of the remarkable natural historian and scientist Darwin was how his careful observations on science and society molded his ideas. Taking this as inspiration, each student designed the natural history expedition of their dreams.